Passing through Northern Ireland by boat, we stopped at two cruiser-friendly towns – Portrush and Belfast. Both have very good facilities and easy access. At Portrush Harbour, the cost to berth is £21.50 per boat per day. The harbour staff are friendly, there are excellent ablution facilities (50p for shower), the laundry is free to use and the nearby Portrush Yacht Club welcomes visitors to pop in for a Guinness and tap feet to local live music. The town has all the amenities for a cruiser – Spar supermarket, hardware, post office, etc. Unfortunately at this time of year the town was overrun with tourists and sticky-face kids! Barry’s Amusements is a popular place for families to spend their hard-earned money and for the kids to burn off some energy. It’s been a long time since we’ve been in a place like this and after so long away from this culture I wasn’t too enamored! Leaving Portrush we had to time it right so that we could catch the south flowing flood tide through Rathlin Sound, expected to be around 4-5kn. At 10am we motor-sailed from Portrush around Ramore Head, passing by the Skerries to enjoy unusually calm seas on a bright sunny day. The rugged coastline dominates the view and it isn’t long before we sail by the natural wonder known as the Giants Causeway on the coast of County Antrim. Our view from the boat is spectacular and the tall hexagonal columns of basalt dwarf the people walking around the tourist trails. Our destination was Glenarm, about 36nm from Portrush, but by 2pm we’d made better progress than expected so decided to continue on to Belfast Lough – 68nm away from Portrush. We were still travelling at 7kn, but this eased as we approached Belfast Lough with the tide against us. We wanted to arrive to avoid a 35-40kn southwest blow the following day. We arrived at Belfast Lough at around 8pm and anchored near to a yacht club at Cultra, about 5nm from Belfast Harbour and the marina. Up early with the high tide and with the threat of an approaching storm we raised the anchor and made our way up the Belfast channel. We had to wait for a Stena ferry to depart before we could enter the channel and continue up passed the Titanic Quarter and docks. 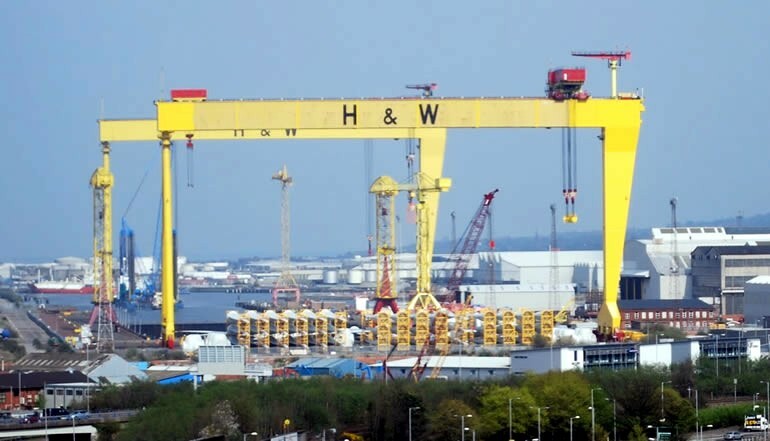 A famous landmark in Belfast are the large yellow “H & W” gantry cranes “Samson” and “Goliath”. Harland and Wolff, ship-builders built three Royal Mail Steamer ships: Titanic, Olympic and Brittania for the White Star Line of Liverpool. We all know what happened to Titanic. Nowadays H&W’s main construction is wind-generators, which explains those tall towers we saw upon arrival at Belfast. 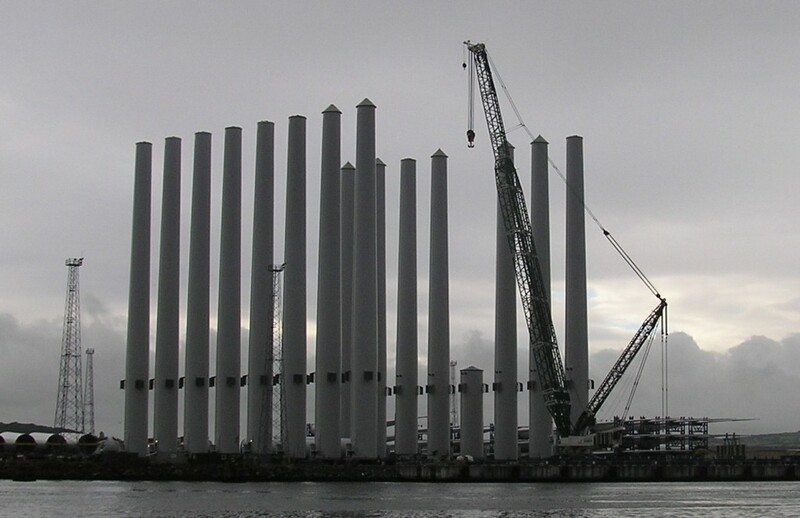 Only when we saw the large blades laid down did we realise how big these wind generators are. By 8.30am we had docked at the small marina in the historic Abercorn Basin. As luck would have it, a friend of mine I hadn’t seen for maybe 12 years and worked with over 20 years ago was visiting Ireland and visited us at the dock just after we arrived. So nice to see you again Kim and Rod! Belfast marina is nicely set up for passing cruisers. There is a pay machine where you pay with credit card a reasonable fee of £16.50 per night per vessel. This includes electricity, water, wifi, showers, toilets, and laundry facilities! The marina is conveniently located at the Titanic quarter and about a 10 minute walk to the city centre over the River Lagan. Right next door is the W5 Odyssey centre with cinemas, Pizza Hut, a pub and more sticky-faced kids! How much Propspeed would you need for these? 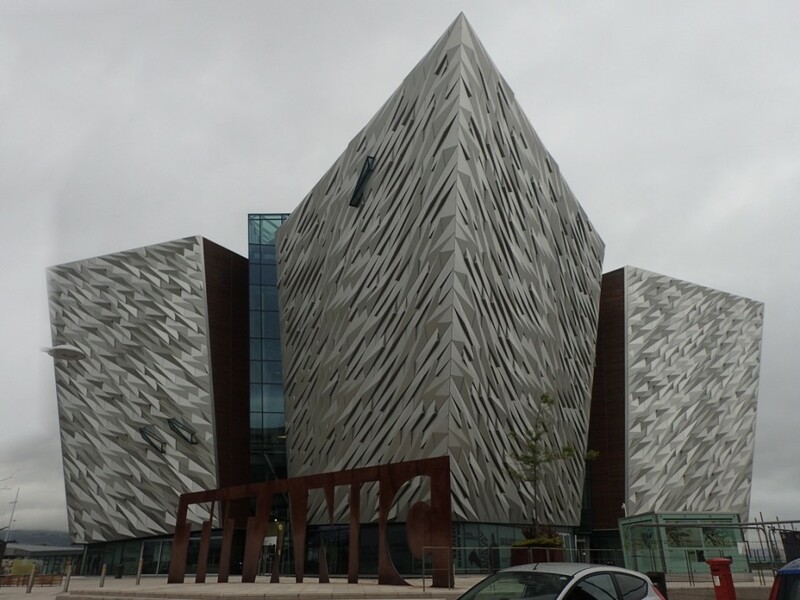 Impressive architecture of Titanic Exhibition Centre. With the Titanic exhibition centre so close, that was our first visit the following day (we re-watched the movie Titanic the night before to get in the zone!). Half the day was spent walking around, enjoying the stories, the information about ship-building, and the visit to the smaller “Little Sister” of Titanic, the Nomadic. The Nomadic was faithfully renovated in 2013 after one hundred years of service. Nomadic was used as tender to Titanic to transport first class and second class passengers to the larger ships which couldn’t dock at Cherbourg in France. On the site where Titanic and Olympic were built side-by-side is a footprint of Titanic which you can walk along. It’s about 270m in length – still long by today’s standards, but not as high as modern cruise ships which often come to Belfast. Of course in Belfast, there is no way to overlook the recent history of The Troubles in Northern Ireland. 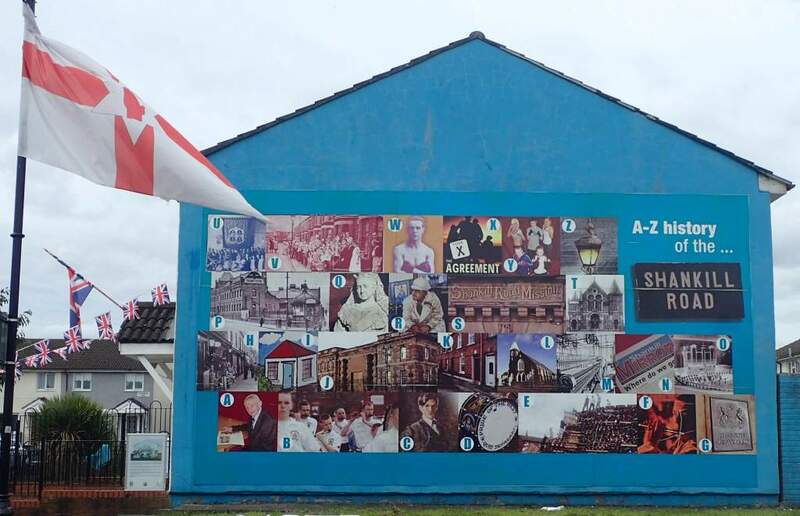 A popular day trip for tourists are to visit the hundreds, perhaps thousands, of murals dotted around Belfast. 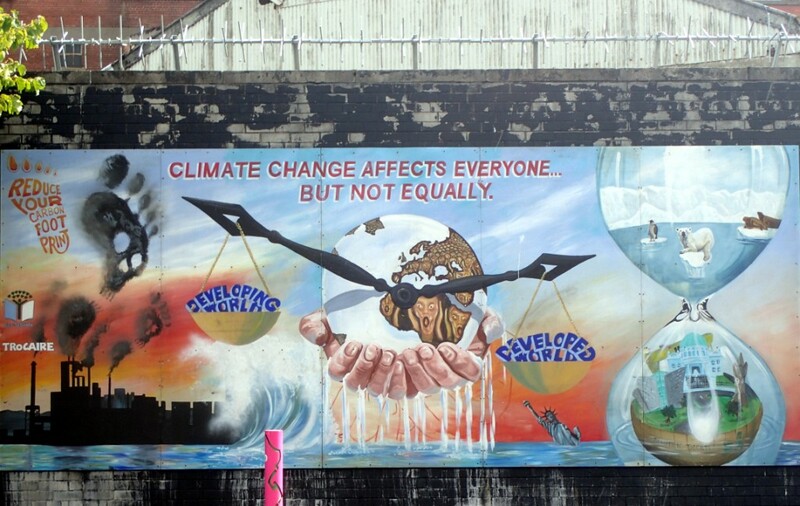 Painted on sides of buildings, Peace Lines and other flat surfaces, the images communicate messages from the various groups – loyalists, republicans, catholics, and protestants. Nowadays though contemporary topics are being painted to bring some optimism for the younger generations. There are a number of ways to visit the murals. Most tourists pay for a taxi tour to drive around the areas between the notorious Falls and Shankill Roads. We chose to hire a Belfast Bike and ride around. This was a good idea until the rain bucketed down on us. But it disappeared soon enough and we continued our trip along Falls Road, passing the office of Sinn Fein and stopping to view the many murals along the way. At one point along Whiterock Road I chatted to a local who was surprised to see a couple of tourist bikes in this area. Seems they don’t get many! There is still a sense of disquiet in West Belfast, but it doesn’t stop the groups of tourists that visit the murals. The following day, I went for a stroll through Belfast and into the Cathedral quarter. Before long I headed west along Clifton Street then Crumlin Road. There were murals in this area so to see them I turned left and headed towards the infamous Shankill Road. The time was around 12 noon on a Sunday and nobody was around. Covering the terrace homes with small front gardens, bunting, flags of both the Union Jack and the Red Hand of Ulster were everywhere, strung from rooftops, flagpoles and lightposts. I felt a little uneasy in this neck of the woods, made even more daunting as I could see the high ‘Peace Walls’ which divide the communities. Out on Shankill Road I breathed out and walked back into the city. It’s almost twenty years since the Good Friday Agreement and the rumblings of the past aren’t so distant. Only a couple of weeks ago a group of youths caused riots in West Belfast, while in central Belfast, police officers were pelted with petrol bombs, stones and other missiles. But in downtown Belfast, things are normal enough. It’s easy to get around, has a good selection of shops (I finally bought a new camera!! ), the St Georges Market fills in a Sunday morning, there’s plenty to see and do including some great architecture, such as City Hall, and of course plenty of pubs and eateries. The waterfront area is developing and makes for a nice stroll along the River Lagan. Staying longer in Belfast than expected is not a bad thing. 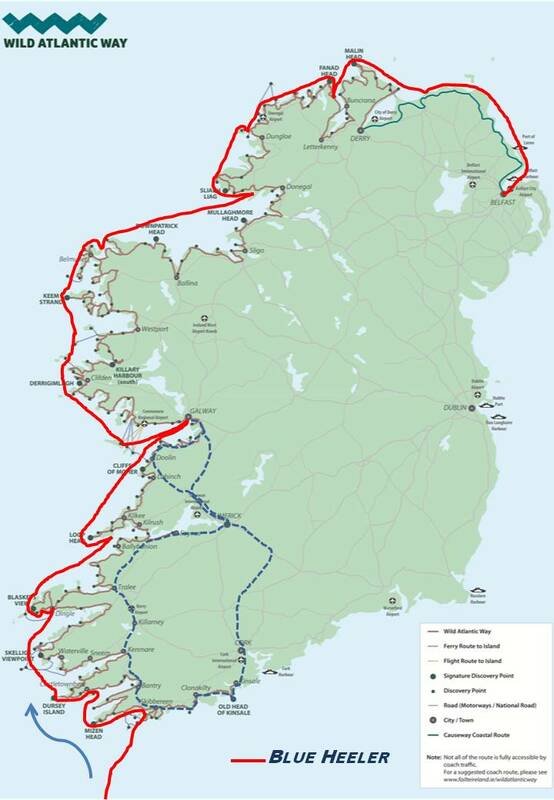 But this weekend we expect the winds to ease and we can make our way down to Dublin, 100nm to the south. We must remember to change courtesy flags! Aside | This entry was posted in 2017, Northern Ireland. Bookmark the permalink.